A Peek Inside Rappers' Brains Shows Roots Of Improvisation : Shots - Health News Scientists have found rappers and jazz musicians use their brains in similar ways when it comes to improvisation. Brain scans show distinct differences in which parts of the brain are most active during rap performances of memorized pieces compared with those that are done freestyle. The warmer orange colors show parts of the brain most active during improvisational rap. The blue regions are most active when rappers performed a memorized piece. A group of jazz pianists had their heads examined in a 2008 PLOS One study, which subjected the musicians to functional magnetic resonance imaging scans. 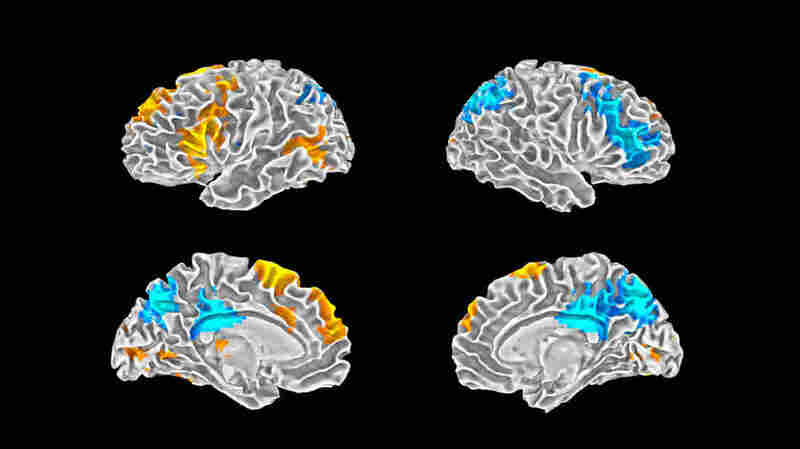 These scans highlight areas of brain activity. When riffing on a tune instead of playing a memorized composition, the musicians had lower activity in a part of the frontal brain that is thought to be responsible for planning and greater activity in another part of the frontal brain believed to motivate thought and action. After hearing about the jazz study, Los Angeles rappers Michael Eagle and Daniel Rizik-Baer contacted one of the researchers, Allen Braun, chief of the voice, speech and language branch of the National Institute on Deafness and Other Communication Disorders. Eagle and Rizik-Baer proposed a similar study on freestyle rap. Soon Braun's colleague Siyuan Liu at NIDCD put together a team, which included the two rappers, to determine what was happening inside these performers' brains. In their study, published today in Scientific Reports, five professional rappers were given a set of lyrics to memorize. A week later each was put inside an MRI machine to put on his performance. "It's not a very natural environment, that's for sure," notes Braun, a co-author on the latest study. "It's noisy and you have to lie on your back. And you need to stay still." The clinical setting may not have been the normal setting for the rappers, but they had little difficulty performing on cue. Each would perform the preset rap, and then they would switch to improvising to the same music track. "By comparing the two, we could see the neural activity associated with freestyle rap," Braun says. When Liu and the other researchers examined the fMRI data, they found that, like the jazz musicians, the rappers' brains were paying less conscious attention to what was going on but had strong action in the area that motivates action and thought. "Unlike the jazz study, these changes were very strongly associated with the left hemisphere of the brain," Braun says. That's the half of the brain where, for most right-handed people, language is processed. The team also found a network of connections in the performers' brains during the freestyle raps, linking parts of the brain responsible for motivation, language, action and emotion. And raps that were rated as more innovative correlated with more activity in the region of the brain that stores words. It's not surprising, says Braun, "that the more creative the rap, the more they're tapping the lexicon." The study is part of a larger body of research that is hoping to determine what is happening inside the brain during the creative process. Braun says that he'd like to know more about what happens in the next phase of creativity, revision. He has recruited a group of poets for that study.